A new method to measure the temperature of atoms during the explosive death of a star will help scientists understand the shock wave that occurs as a result of this supernova explosion. An international team of researchers, including a Penn State scientist, combined observations of a nearby supernova remnant—the structure remaining after a star's explosion—with simulations in order to measure the temperature of slow-moving gas atoms surrounding the star as they are heated by the material propelled outward by the blast. 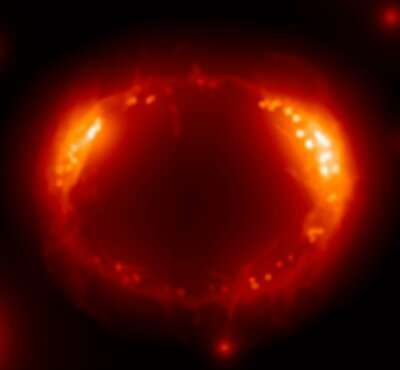 The research team analyzed long-term observations of the nearby supernova remnant SN1987A using NASA's Chandra X-ray Observatory and created a model describing the supernova. The team confirmed that the temperature of even the heaviest atoms—which had not yet been investigated—is related to their atomic weight, answering a long-standing question about shock waves and providing important information about their physical processes. A paper describing the results appears January 21, 2019, in the journal Nature Astronomy. The explosive death of a massive star like SN1987A propels material outwards at speeds of up to one tenth the speed of light, pushing shock waves into the surrounding interstellar gas. Researchers are particularly interested in the shock front, the abrupt transition between the supersonic explosion and the relatively slow-moving gas surrounding the star. The shock front heats this cool slow-moving gas to millions of degrees—temperatures high enough for the gas to emit X-rays detectable from Earth.